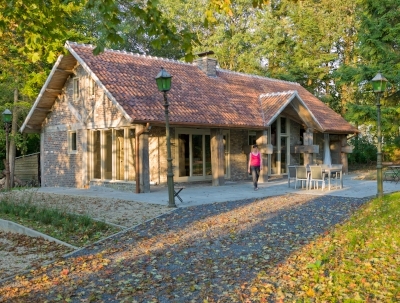 Paul’s Place is located in the Hazebos (‘Hare’s Forrest’) in the village of Zonnebeke, close to Ypres. 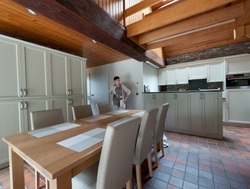 It is a fully equipped and furnished holiday cottage, where up to six people will find everything they need to spend a perfect self-catering holiday. The grounds cover over 5,000 square metres (over 1.2 acre), partly consisting of forest. There is no through traffic whatsoever, which guarantees complete quiet and personal privacy. Hares (what’s in a name!) and rabbits will keep you company on a regular basis, so we’re afraid we can’t allow any pets on the premises. 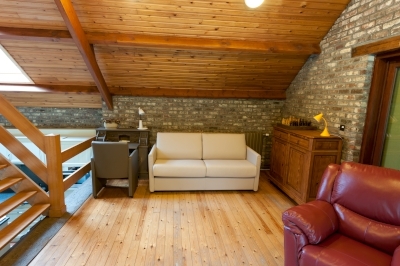 The chalet is divided in four half-open floors and one basement. On the ground floor are a lavatory, a bathroom with step-in shower, a dining-room and a fully equipped kitchen, complete with refrigerator, combined oven, dishwasher and all the necessary kitchen utensils. A few steps up, is an in-between floor with a reading-corner and the first bedroom. An extendable sofa doubles as an extra bed, bringing the sleeping capacity to six. The second bedroom is only a few steps higher. 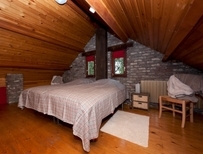 Both rooms are large enough to accommodate two people, and are supplied with bed linen. Slightly lower than the ground-floor you’ll find a large drawing-room with an open fireplace, a TV set, a stereo system and some bookshelves. Apart from a variety of reading material, you’ll find many books on the Great War, and a good selection of hiking and cycling maps. There is also collection of board-games, DVDs and CDs. Wifi is available without extra charge. 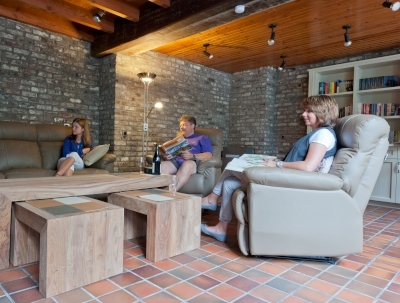 Outside is a patio with garden furniture, a covered BBQ and a jeux de boules course. There is ample parking space near the cottage.